Dr Rangana Rupavi Choudhuri (PhD). Dr Rangana Rupavi Choudhuri (PhD) is an international speaker, author and trainer who discovered the power of coaching in her corporate career while leading global teams, of 200 – 4000, through leadership as well as influence. Subsequently she discovered NLP and how it enabled rapid breakthroughs in life, health, career, relationships, finances and spirituality. She has trained with the founding masters of NLP as well as Tony Robbins and now has developed her own system known as Breakthrough coaching which combines NLP, Hypnosis, Timeline Technology and Coaching to enable success and fulfillment. She is a Master Trainer and trains leadership teams, celebrities, executives, high profile facilitators and those who want to be professionally qualified as a trainer or coach. 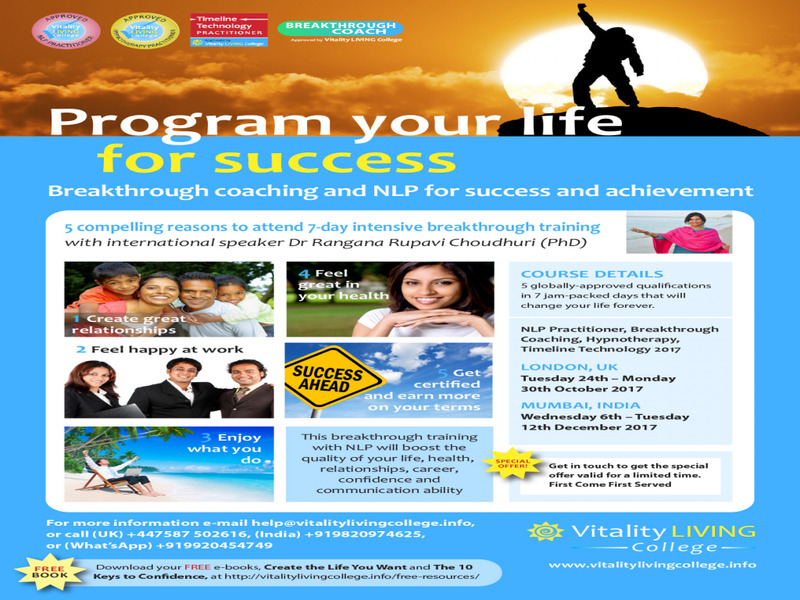 Her Breakthrough to success program with NLP coaching is highly interactive, application based and transformational in every way. NLP Practitioner training is excellent for those who want to develop personally, coach others, influence customers, negotiate for win win outcomes. It is routinely used by professionals in all fields - for examples lawyers, doctors, accountants, consultants, business owners, trainers, teachers, parents, social workers, nurses, counsellers, coaches, therapists, nutritionists, executives, managers as well as employees. NLP is a powerful coaching system to create the life you want. It allows for lasting breakthroughs, insights and transformations. For a limited time there is a special offer of that can save you in excess of Rs 10000. Call, message or email us immediately to secure this offer. To book or for more information contact us right away on +919920454749 (India) or (What’s App/SMS) +919820974625 or email me back on india@vitalitylivingcollege.info.